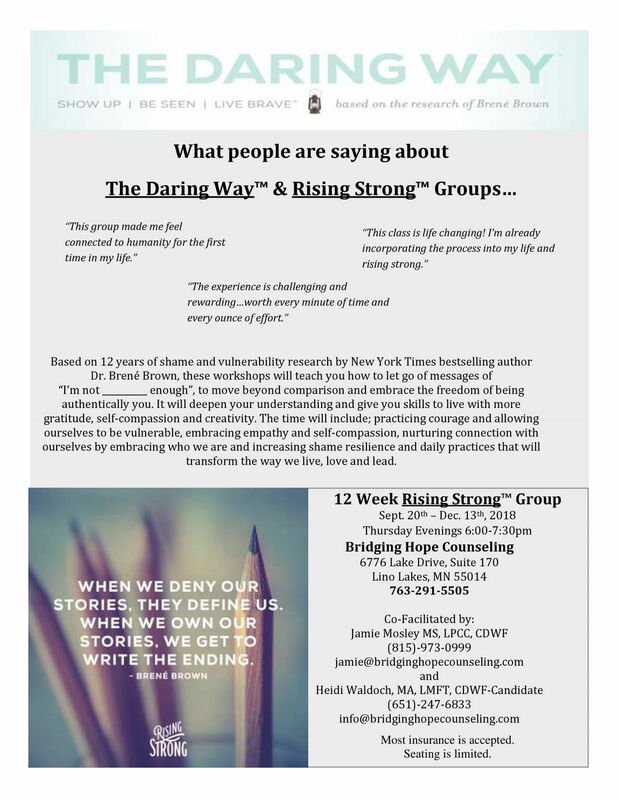 Based on 12 years of shame and vulnerability research by New York Times bestselling author Dr. Brené Brown, these workshops will teach you how to let go of messages of “I’m not __________ enough”, to move beyond comparison and embrace the freedom of being authentically you. It will deepen your understanding and give you skills to live with more gratitude, self-compassion and creativity. The time will include; practicing courage and allowing ourselves to be vulnerable, embracing empathy and self-compassion, nurturing connection with ourselves by embracing who we are and increasing shame resilience and daily practices that will transform the way we live, love and lead. Please contact Bridging Hope Counseling at (763) 291-5505 for more information and to register for this series.